On the occasion of celebrating 5 years of Okruženje’(‘Vicinities’ in English), the European Fund for the Balkans and the Centre for Democracy and Reconciliation in Southeast Europe (CDRSEE) organised a special panel discussion having Ms Zvezdana Kovač, (CDRSEE Executive Director) as moderator and Mr Axel Dittmann, (German Ambassador in Belgrade), Mr Hannes Swoboda (CDRSEE Chairman), Ms Hedvig Morvai (EFB Executive Director) and Vladimir Šestović (European Civic Forum) as speakers. – Mr Hannes Swoboda (CDRSEE Chairman), Mr Milo Đukanović (Former Prime Minister of Montenegro, Mr Stjepan Mesić, (Former President of SFRY and Croatia) and Ms Hedvig Morvai (EFB Executive Director). This anniversary year was also marked by the special award for “Vicinities”. The Jury of the ‘European Citizenship Awards 2016’ gave the special commendation in the ‘Media Initiative of the Year’ category as it is the first and only regional current affairs talk show, which brings together influential guests from all the countries of the Western Balkans. Now in its fifth season, the number of TV stations that have expressed an interest in broadcasting Okruženje increases every year, and the programme is currently aired on 11 national channels throughout the Western Balkans: TV B&HT, BN TV, Kanal Ri, RTK1, RTK2, RTS, RTSH, TV Alsat-M, TV Vijesti, TV Slovenija. Even during the off-season, Okruženje makes a significant impact and gains viewership, as 33 regional TV stations re-broadcast it, across Bosnia and Herzegovina, Montenegro and Serbia. Each episode comprises four distinguished guests who discuss an issue of current importance, and they are joined by a live studio audience. The guests are always experts in their fields and from four different countries; speaking either a mutually understood language – Croatian, Serbian, Bosnian and Montenegrin – or Albanian, via translator. The live audience includes the alumni of the European Fund for the Balkans. The hosts are Zvezdana Kovač, Editor-in-Chief of Okruženje and Executive Director of the CDRSEE and, up until recently, Nenad Sebek, while the Editor of the series is Vladan Mićunović – all seasoned journalists with decades of experience. When the first pilot season was aired in spring 2012, it was hard to imagine how successful the project would become. The popularity of the show demonstrates how important it was for the viewers to see that many of their problems are shared and how they can be addressed in a civilised way, even when it comes to the most sensitive topics. 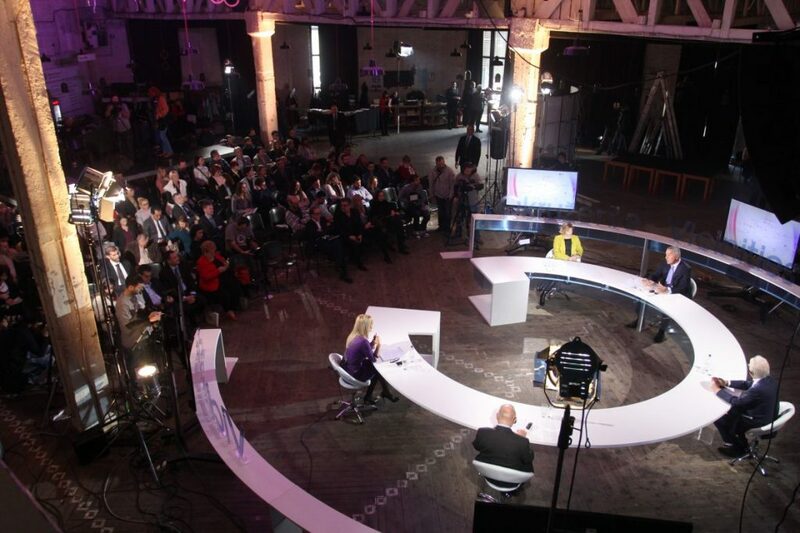 This was precisely the idea of the Center for Democracy and Reconciliation in Southeast Europe (CDRSEE) and the European Fund for the Balkans (EFB) when they decided to launch this television project, and over the years, it has gone from strength to strength, with its significance recognised and financially supported by the Ministry of Foreign Affairs of the Republic of Germany. Over five seasons, almost 200 guests have tackled 50 topics, including international disputes, identity, youth unemployment, war crimes, language, history teaching, the future of the European Union, demographics, corruption and crime – to name just a few topics. In August 2015, Okruženje made history. For the first time ever, Serbian Prime Minister Aleksandar Vučić and Albanian Prime Minister Edi Rama came together in the same studio, on the sidelines of the Western Balkans Summit Vienna 2015. In Serbia, about two million viewers tuned in to watch, while in Albania the national broadcaster drew 85 per cent of viewers — the channel’s highest viewership share ever, and among the highest ever posted in Europe. As a reward for its relentless efforts and unflagging drive to succeed, in September 2015, Okruženje received the jury award in the ‘Media Initiative of the Year’ category at the European Citizenship Awards’ 2016 ceremony in London’s City Hall. With the award, the jury acknowledged Okruženje’s achievement in promoting European values and improving the lives of communities in terms of participation, democracy, rights and social justice.